Welcome to Mykonos of the incredible light, of the myriad of beaches of sand, stone, raucus and quiet, to the whitewashed houses and tiny lanes, to tiny chapels and churches here, there and everywhere, to a chic ambience amid simplicity, to bars and clubs and meeting new friends, to tolerance, freedom and individuality! The most cosmopolitan destination in all of Greece, Mykonos (alternative spelling Mikonos or Myconos, sometimes even called by its American friends Mikanos) has long been known for its incredible, long sandy beaches overflowing with singles looking to connect, honeymooners beginning their new lives together, couples, families, surfers, and gays, all enjoying the crystal clear waters and brilliant sunshine. Mykonos is also renowned for its outrageous nightlife, with more bars and discos per square foot than just about anywhere else on the planet. Its trendy shopping has attracted even the likes of Armani, Donna Karan, Cartier, and Bulgari, just to name a few. Its chic ambience can be seen everywhere, from marvelous gay bars to gourmet restaurants, and from hundreds of jewelry shops to offbeat galleries. No wonder all the cruise boats, from the smallest to the largest, stop at Mykonos, even if just for the day; its marinas are always full of VIP yachts and sailing boats, filled with incognito rock stars, designers, movie stars, and politicians! 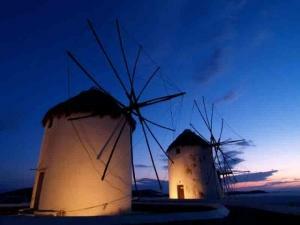 Windmills Travel acts as exclusive sales agent for a great number of studios and apartments in/near Mykonos Town. The view of Mykonos Town from the ship approaching the island is breathtaking. Mykonos is one of the top destinations for Cruise Programs in Mediterranean Sea. Mykonos Little Venice View from the Windmills on a cloudy day. Mykonos Ai-Nikolakis Church (St. Nicholas of the Chain) at the Old Port. Initially built on an islet in the port, which was later connected to the quay. Mykonos Octopus Drying in the Sun; eventually the best 'meze' for ouzo. Windmill in sail in the background is housing the agricultural museum. Mykonos Town Alleyway. Try to distinguish the Chapel on your far right down the hill. Hint: it has a red roof! Mykonos Sunset; parched by the sun and cooled by the 'meltemi' breeze, Mykonos colors are to have some rest. Mykonos Ai-Nikolakis Church at the Old Port.